THE MAYBELLINE STORY : In 1967 the effectual buyout of the Maybelline company was $132.3M! - That would be $923,076,923.08 today. In 1967 the effectual buyout of the Maybelline company was $132.3M! - That would be $923,076,923.08 today. 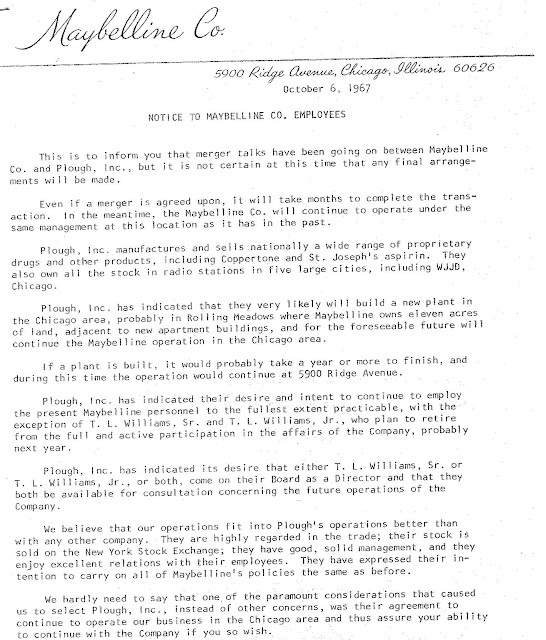 This week I will be posting the original newspaper articles and letters explaining the Merger between Maybelline and Plough Inc., (most graciously given to me by Maybelline Executive Harris A. Neil Jr.) I can assure you that Business or History Students will appreciate the magnitude of these documents. 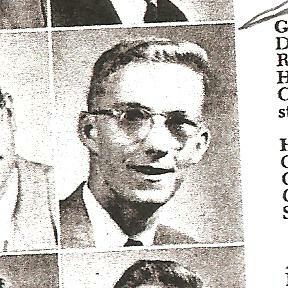 Stay tuned as this incredible merger unfolds through priceless communications between 1968 through 1989. 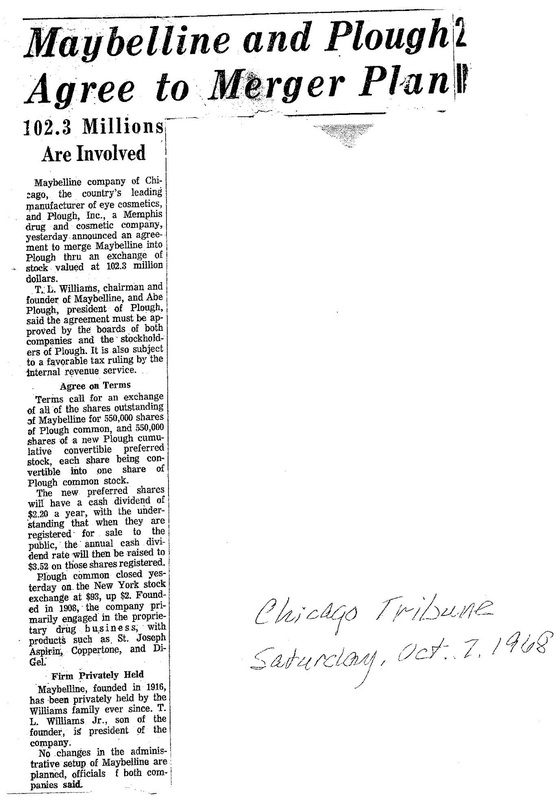 Article in the Chicago Tribune, Dated Saturday, Oct. 7, 1967. 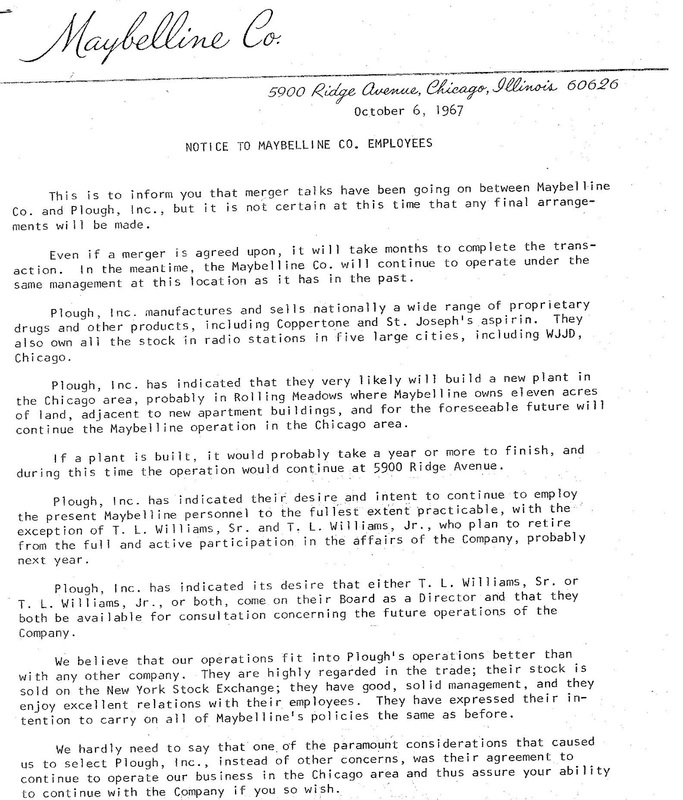 Plough was quickly and shrewdly chosen as the suitor: They offered a minimum of $100M and there was a period of grace, whereupon the stock would float, then a specific day, which was 2/28/68 that the Plough stock price would be "pegged" for the official exchange. 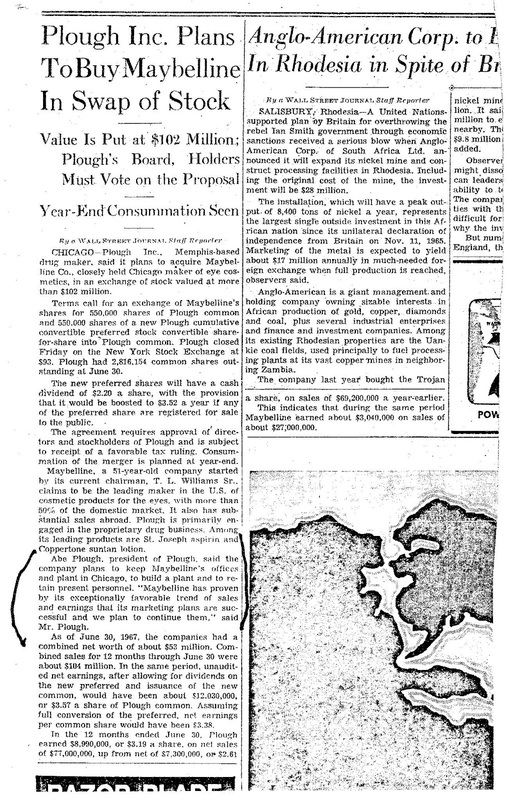 On 2/28/68 the price of Plough had rallied so dramatically that the effectual buyout of the Maybelline company was now $132.3M! Yes, it was leverage that caused this! Demand plus fewer shares caused a stock breakout, which is a scenario seen on Wall Street each day. Stay tuned tomorrow as the drama unfolds in letters from Abe Plough to his new employees at Maybelline.